Are you drawn to shiny sparkly objects like I am? I love metallic accents in artwork, sometimes a bit TOO much. 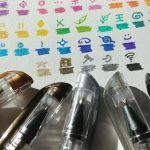 I can wax poetic about my gold pens and watercolor paints, which I might do in another post. 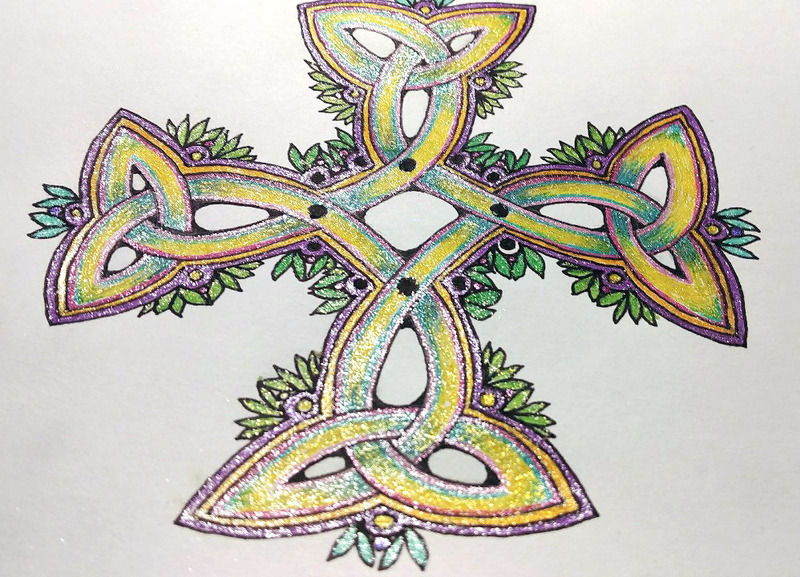 And I especially love these for adding a touch of shine to Celtic Knotwork pieces and Illuminated Letters. Today I want to share with you the new (ooh, SHINY!) 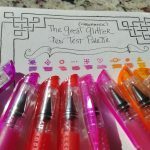 sparkly and glitterly pens that came across my desk. 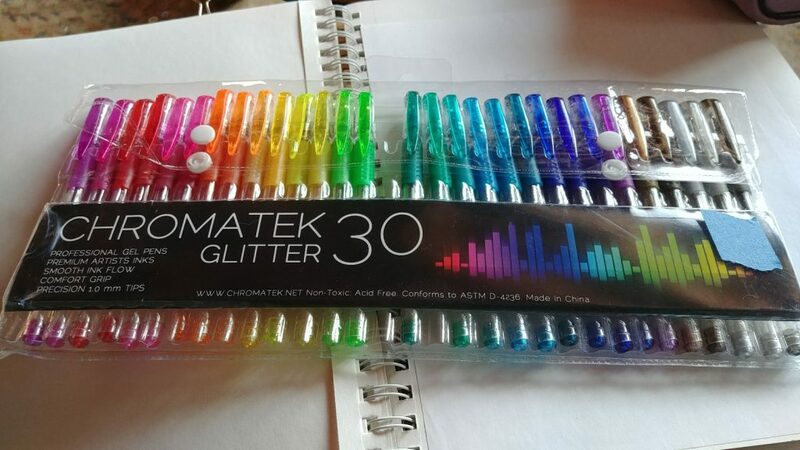 The lovely creator of the new CHROMATEK Glitter 30 gel pens contacted me to try out her product. 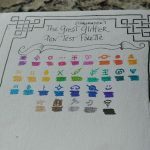 They come in a package of 30 pens with many shades of colors and a complete set of refills, which was an unexpected plus. 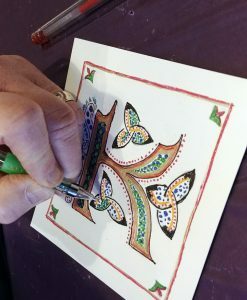 I decided to give them a run as I was creating final artwork for my third Celtic Knots class on Skillshare, and created a large Carolingian Cross using nothing but these pens, with many colors. It’s not usually my style to be THIS glittery, but wow, I really loved the shine, and I’m not sure the photos here do them justice. 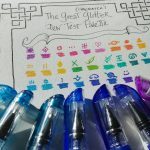 I still have loads of things to try with these pens, but they are nice to hold, put out ink in a fine glitterly layout and the colors are just scrumptious. 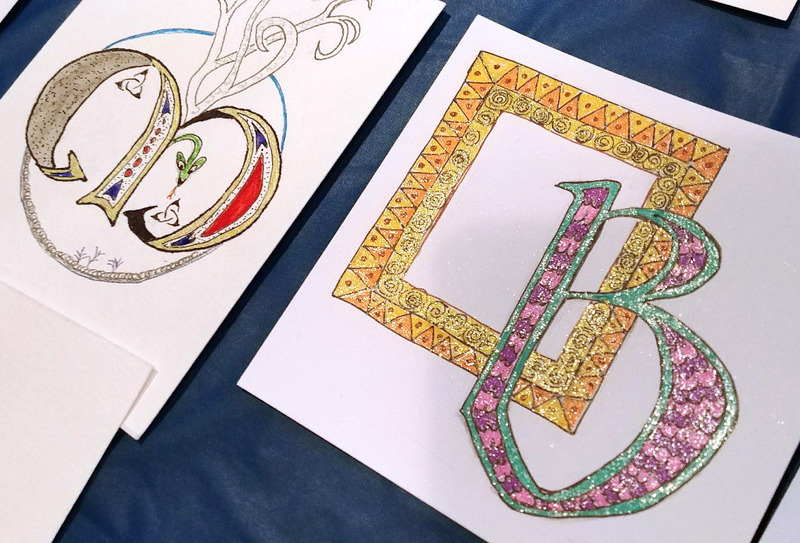 And as much as I loved playing with them, so did the participants in a recent Celtic Illuminated Letters workshop I taught a few weeks ago. These pens were clearly the winning art supply in the room, seeing that pretty much everyone kept coming back to my table to try them! 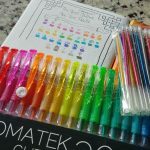 I’m GIVING AWAY a set! Congratulations, Jane, and I’ll be contacting you to mail out the pens! 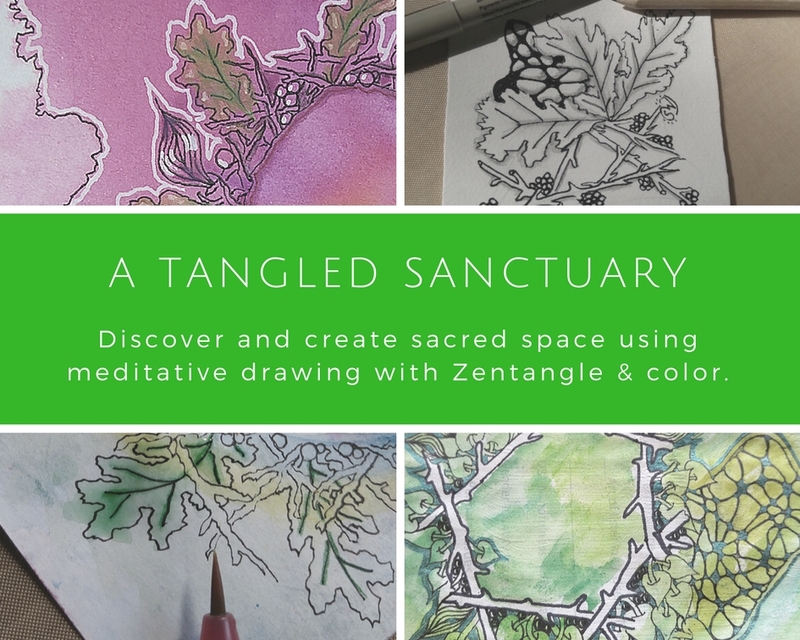 Looking for some new designs to help you find your calm spot, a bit of peace and color? 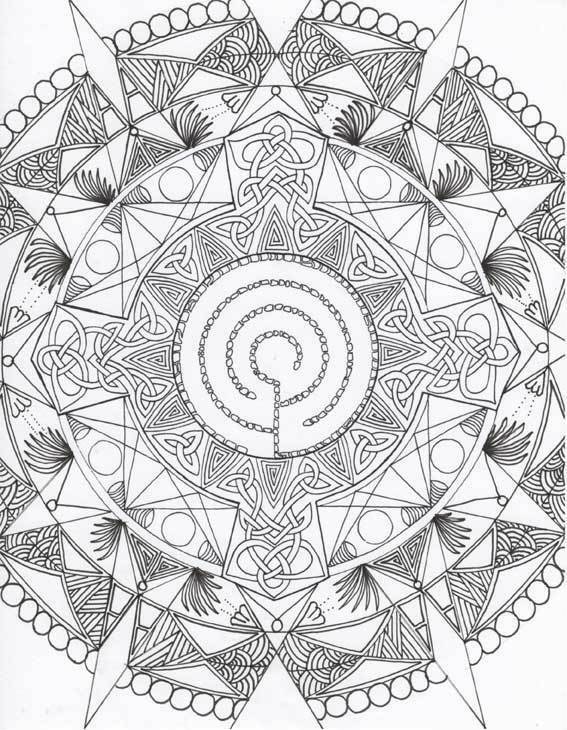 Sign up and get a link to my latest coloring page, along with some helpful coloring tips and links in the next few emails, and other heARTful news in your email. 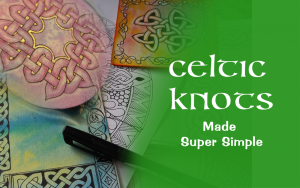 This entry was posted in Celtic Knotwork, Giveaway, Stuff I Love. Bookmark the permalink. Hi Nancy! Super! I look forward to seeing more of your art journaling! “I see you everywhere!” That’s one of the best compliments an entrepreneur can receive and I’m gifting it to you today, Sadelle. Kudos on all the many ways you’re creating connection opportunities for your beloved tribe. Count me in as one of those members! Thank you for a great review. 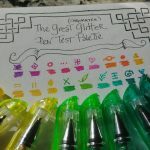 I love all things sparkly and have a few glitter pens in my stash that I use to highlight watercolored sketches in my journal. It is an interesting combination and I am still practicing. Sometimes the glitter pens add just the right amount of sparkle but sometimes I get overstimulated and the sketch gets a tad “busy” but its all fun! These knots and colors are always catching my eye as I scroll through social media. Beautiful job! So I have already liked/joined your pages/blog/instagram, but I did comment/hashtag and threw some names to you. Who wouldn’t want to win a set of those gorgeous pens????????? Thanks Jane! (and hi!) Yes, thanks for commenting on and finding the FB and Instagram posts. Good luck! Yeppers, I too want a chance at the pens. 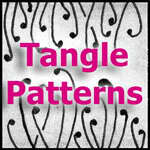 Hope I’m qualified to participate as I’m on your mailing lists, and am taking your SkillShare courses. (I haven’t reviewed the 3rd course yet as I haven’t had time to do the work. Hoping to get to that next week!) May the luckiest person win the pens! Thanks for the chance to win these. If I win I’ll be choosing a few colors for myself then sharing the rest with friends. I have liked and followed and commented on facebook and liked, followed and commented on instagram (justaddwatersilly). I followed you on Instagram (why wasn’t I doing that already?! ), and FB. I think I’m already in the email VIP community. 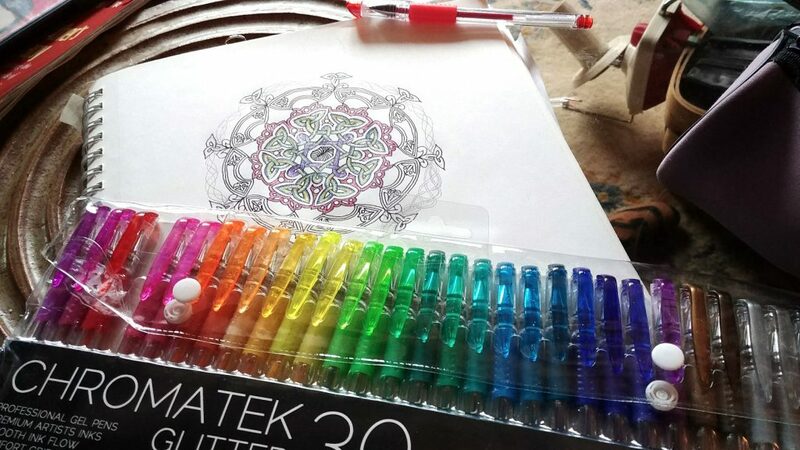 These pens look very cool, and your right – the photos here do them WAY more justice than on the Zoom video. What might I do with them if I won? . . .
First off, I suspect I’d stay up too late playing with them, lol! Then I’d probably have a go at some Illuminated letters – LOVE your “M” with the little green serpent! Carol thanks!! I’m having issues with Instagram today, so I can’t see who followed me… Thanks for coming to today’s drawing session and sharing! And good luck!